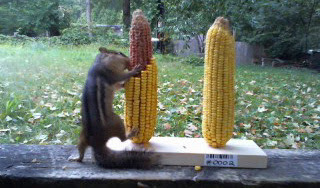 Do wild animals avoid GMO corn? Join the experiment! This is exciting – a group of serious scientists have launched a crowd-sourced experiment to test the hypothesis that wild animals such as squirrels and deer prefer non-GMO corn, and avoid GMO corn. It's exciting because you can participate – it's easy. I just listened to the Talking Biotech podcast #20 on the corn experiment. Kevin Folta and – Karl Haro von Mogel do a deep dive into the design of the experiment. If you donate $25 or more at Experiment.com you will receive your own kit. And you can put your school on the waiting list for a free experiment. Donate, contribute a bit of your time and you can be part of a real science project. You will learn how an experiment like this has to be designed so that the results will survive peer-review. And if the hypothesis is supported by the data I think the resulting peer-reviewed paper might make the cover of Science! All the supporters will be listed as contributors in the paper. This entry was posted in Biotechnology and tagged GM-Food, GMO by Steve Darden. Bookmark the permalink. Brilliant! I’m curious about the response of the GMO-science deniers. My boys and I can’t wait to do this. We have some interesting animals and disgusting insects in Florida so I’m a little nervous about what I’ll wake up to. It’s fun to be able to participate. That experiment is an excellent idea. One would think that if animals favored non-GMO corn the GMO-science deniers would already have proof to back up their claims. The nature of that experiment is such that manipulation could invalidate the results. Even without manipulation extreme care would be required to ensure valid results. Even slight differences in soil composition could make a difference.